Do you like antique bikes? Do you have an old or antique bike to sell? Do you like free events? 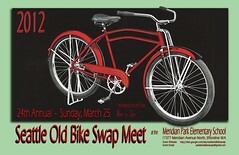 Then the Seattle Old Bike Swap Meet might be for you. Authorities are searching for a 67-year-old San Francisco man who mysteriously disappeared from a bicycle tour campsite in Death Valley last week. The man, George Kohler, was a member of an Adventure Cycling Association group of cyclists participating in Death Valley Loop I. They were camped on March 12 at the Mesquite Spring campground in the north part of the national park. While others remained at a campfire, Kohler announced he was tired and heading back to the tent. The official grand reopening of the Burke Gilman Trail through Lake Forest Park will be celebrated on Tuesday with a ribbon-cutting ceremony and a bike ride. A 2-mile section of the trail was closed between Log Boom Park and 145th Street for about 8 months. It reopened to positive reviews in mid-February. Work crews contracted by King County widened the trail to 12 feet, improved sight lines, repaved the cracked surface and replaced a series of stop signs with yield signs. Bicycling fans will be cruising on down to the Smith Cove Cruise Terminal this weekend for the 2012 Seattle Bicycle Expo. Presented by the Cascade Bicycle Club, the annual event features some 200 exhibitors as well as speakers, demonstrations and performers. The North American Handmade Bicycle Show gives bike builders an opportunity to display their wares to the public. It also gives them a chance to gain recognition for their hard work.